Did you know that the name "Rocky Road" started as a flavor of ice cream, that hard-to-resist combination of chocolate ice cream laced with chunks of nuts and marshmallows? William Dreyer came up with this cleverly named ice cream back in 1929, and it was, and still is, a best seller. Its popularity is probably why the chocolate-nut-marshmallow combination is now found in so many desserts. 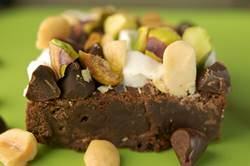 One recipe I really like is these Rocky Road Brownies. These brownies are amazing, with their deep chocolate flavor topped with soft and gooey marshmallows all jumbled together with chocolate chips and nuts. Rocky Road Brownies begin with a brownie that gets its deep chocolate flavor from unsweetened chocolate, which is chocolate in its rawest form. This type of chocolate has a strong, bitter taste, which you cannot eat out of hand but is excellent when used in baking. These brownies are very similar to the Katherine Hepburn Brownies only they contain a little more flour and double the amount of unsweetened chocolate. Again, as with most brownies, they are simply made using one bowl and are done when a toothpick inserted into the center has moist crumbs clinging to it. As soon as the brownies are removed from the oven, sprinkle the top with miniature marshmallows (store bought or home made), chopped nuts (can use chopped almonds, hazelnuts, pecans, peanuts, walnuts, and/or pistachios), and milk, white, or semi sweet chocolate chips. The brownies are then returned to the oven for a few minutes so the marshmallows can melt into a nice gooey layer that holds all the nuts and chocolate chips in place. So good. Rocky Road Brownies: Preheat your oven to 325 degrees F (165 degrees C) and place your oven rack in the center of the oven. Line an 8 inch (20 cm) square baking pan with aluminum foil and butter the foil (or spray with a non stick vegetable spray). Melt the chocolate and butter in a large stainless steel bowl placed over a saucepan of simmering water. Remove from heat and whisk in the sugar. Next, whisk in the vanilla extract and eggs, one at a time, whisking well after each addition. Finally, stir in the flour and salt. Pour evenly into the prepared pan and bake for about 25 minutes, or until a toothpick inserted in the center comes out with a few moist crumbs. Remove from oven and immediately sprinkle the brownies with the miniature marshmallows, chocolate chips, and chopped nuts. Return the brownies to the oven and bake for about 5 minutes, or just until the marshmallows start to melt. Remove from oven and let cool on a wire rack.